How is a lampshade like a fire hazard? Every skype conversation with my parents begins the same way: “Hello? Can you hear me? I can hear –wait hello? Now I can’t see you. (Typing: turn your camera on) Okay that’s better. Wait can you hear me?” etc. Last night we repeated this sacred ritual and like usual surprised ourselves with a successful conversation. After talking about weather and church for an appropriate amount of time, given our backgrounds as Middle Americans, my parents commented that my video’s quality was quite poor. Based on the image, I was a freak that lived in a highly pixilated cave, one side of my face shadowy with never ending night and the other a dull orange. Also, of course it’s a fire hazard! Sometimes I look over and the scarf is draped on the naked bulb in a forbidden embrace. 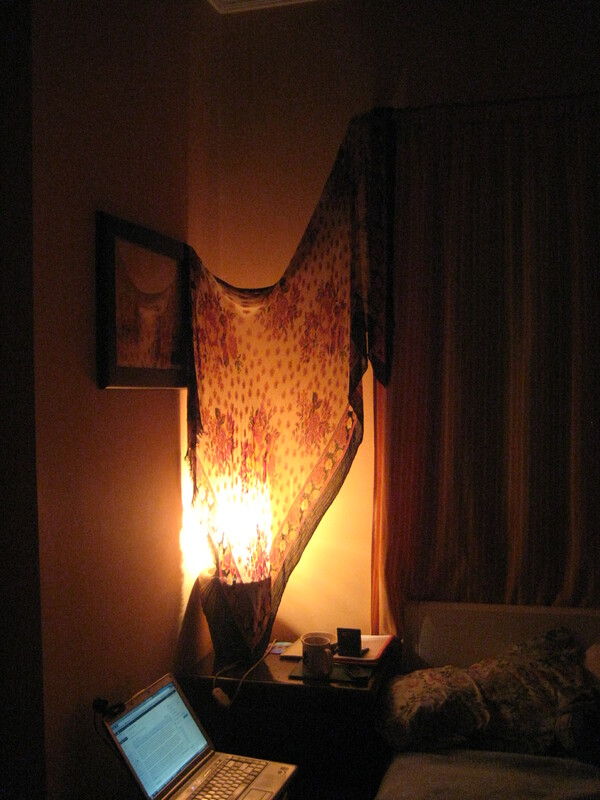 If I had left the room with the bulb and scarf in such a position, who knows what I would have found when I got back. The sock I’ve been looking for? A hole singed in my scarf? A fiery chamber of death? It could be anything! So yes. Technically, this precarious set up is slightly dangerous. However, let’s not forget the fact I live in Egypt. The makeshift lampshade, or pre-fire if you will, is only one of many dangers I face daily. I also have to cross the street, no small task in a city with 5×10-7 crosswalks per person and billions of cars. Furthermore, according to World Bank statistics from 2004, Cairo is among the most polluted cities in the world. These pollutants daily become a part of my body, which itself is becoming more flammable. They’re also pollutants I’ll be bringing back with me to the states, where I intend to get as much medical work done as possible while still on my parents’ insurance. For further questions on what should and should not be worried about and/or quotes from Late Night with Conan O’Brien circa 2006, please contact me. Thanks. Whenever I talk to my parents via Skype I always have to combat (a) their shoddy internet connection, and (b) Dad’s interpretations as to why their internet connection is shoddy (I’ve heard everything from ‘There must be a storm somewhere’ to ‘I ate a lot of cheese today. Do you think that could be influencing it?’ Well, no, I made that last one up, but he is rather computer illiterate). Not sure if you explain this elsewhere, but is ‘snotting black’ a reference to the changed colour and consistency of your nose gunk since moving to Egypt? I’ll pretend you said ‘yes’ so that I can tell you that when I moved to London, I noticed the same thing. Now I’m living in Brussels it’s relatively back to normal. Titters-a-plenty in your posts! I’ll be back! You’re exactly right! The internal condition of my nostrils has taken a turn towards the dark side a darkness that continues even when the snot leaves the nostril as opposed to the kind of darkness that simply results from being inside a dark place. I hope my own nostril conditions will once again go back to normal. Until then, I’ll be blogging. I’ll probably be blogging after then too. Once I had a glow in the dark snow glove, so I had an idea. It then proceeded to melt, which is really freaking confusing. Only a bit of it was glowy, so how’d the fabric melt?! These are the questions that keep me awake at night…what was the inside like? Gooey. Although, in retrospect, it’s probably good it didn’t work. The lamp light it would have absorbed could have destroyed the earth. Kaboom! Just great entertaining writing. I starts of with this easy humor and continues seamlessly to the end. I mean every article, not just this one. Well thank you very much. I’m glad you enjoy reading the stuff that I enjoy writing. haha, I think EVERY skype conversation with parents starts like that. It has definitely been that way in my experience. Thanks for reading! I don’t know about the bulb, but I once burned down a cave with the base of a lamp. And it wasn’t plugged in. The cave, not the lamp. Hahahaha, believe me a lampshade like that can be an amusingly terrifying fire hazard. Especially if you replace it with socks! I speak from experience. Back when I was seven or so, I was playing around with my older sister and she took one of my socks and threw it in the air, and it landed on my little lamp on the bare bulb. (It was one of those smaller overhead lights installed over my bed so I can read before I sleep). We laughed ’cause it landed there so randomly. Then we had to go get dressed to go out to dinner. We were about a minute away from leaving the house when my mom smelled something burning. My sister and I looked at each other in horror when we realized WE FORGOT THE SOCK ON THE LAMP. Needless to say, it burned a hole right through the thing. We didn’t get into trouble, but we did get a “For the love of God, never do something like that again”. I had no idea there would be such a connection between socks and lamps. Mmmmm I can smell the sizzled sock right now. Haha that’s what I figure. Better just not to worry. Just before I got to the part about mom’s fire hazard warning, I was thinking the same thing. Mothers are like that. I love the stories here. Have fun, and watch the traffic…. Solid advice. I’m just going to add eating good peanut butter to the list, before watching traffic. You know that sock you’re looking for? Take its mate and pull it directly over the bulb. Your scarf will no longer be a fire hazard and you’ll have defused light. Added bonus: the missing sock will turn up (because you no longer need it) but it will not be a single sock, it will be an extra lampshade. Please don’t give her any more ideas! Everything you write is so well written. I did not know you are living in Egypt. What brought you there? Thanks for the kind words—I’m studying Arabic here until May. So I guess love for the language of scribbly brought me here. 🙂 Glad I am fodder for your stories…..and they ARE stories! Stories grown from the truth and showered with love. One night I was wearing a lampshade and I set the table cloth on fire. So BEWARE the lampshade! Cause they really ARE fire hazards!